One of the main activities of the «Plastic» plant – manufacturing and sale of domestic ABS plastic. We produce a number of brands of this material, giving our customers a choice. In addition, our company has arranged the production of parts from ABS plastic to order. The full name of the material in question is acrylonitrile butadiene styrene (abs). It is a product of copolymerization of: Acrylonitrile, Butadiene and Styrene. It’s being manufactured and sold in granules and powder. The plastic is mostly opaque. Our company is Russian manufacturer of ABS plastic that uses technology purchased from the Japanese company Asahi Chemical International, LTD. The technological process involves the emulsion copolymerization of Styrene with the addition of a Butadiene rubber and Acrylonitrile. The use of Japanese technology ensures impeccable quality ABS plastic, which you can buy from us. ∙ German machineries for dosing, mixing, compounding, packaging of material, and implementation of other technological operations. We produce a range of molding and extrusion grades of ABS plastic. Among them you will surely be able to choose the ones that best fit your needs. You can purchase ABS plastic in Trading house «Plastic» from Moscow or any other city. Contact our experts for advice on the purchase of material. It is possible to buy the material in natural color or painted in a particular hue, both in small bulk and large wholesale. In the catalogue of OJSC «Plastic» there are few grades of extrusion ABS plastic. The extrusion process of ABS plastic is as follows: the material is melted in the extruder, then it is being «pushed» through a die, followed by cooling and calibration. The advantages of extrusion ABS plastic high impact characteristics, mechanical strength and rigidity. Ekstruzionnye ABS plastic available in natural color or dyed, such as black or gray. 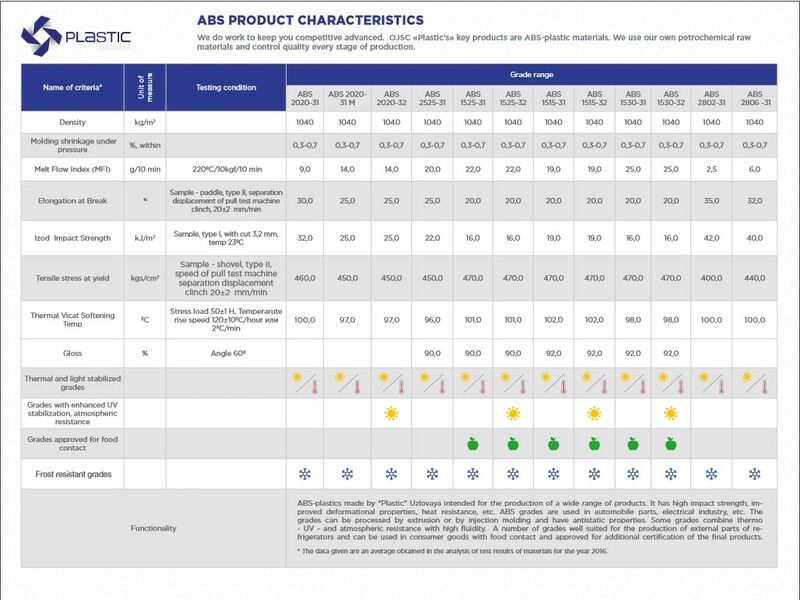 ∙ a number of other products from ABS plastic extrusion. OJSC «Plastic» offers a wide selection of brands molded ABS plastic. The main method of processing injection moulding ABS plastic – injection molding on injection molding machines. This method involves heating of material to a figurable state, and then plastic is injected into a molding form and cooled. Molded ABS Plastic Brands are characterized by high melt flow index, separate brand have burning resistance, anti-static properties. Resistance to high temperatures enables the use of molded ABS plastic for manufacturing of parts in automotive industry. Some brands have the features of raised firmness and yielding flow, which allows to manufacture the small parts of the instrumentation and the automotive industry, a variety of technicals. Heat-resistant molded ABS is suitable for compounding with polycarbonate. 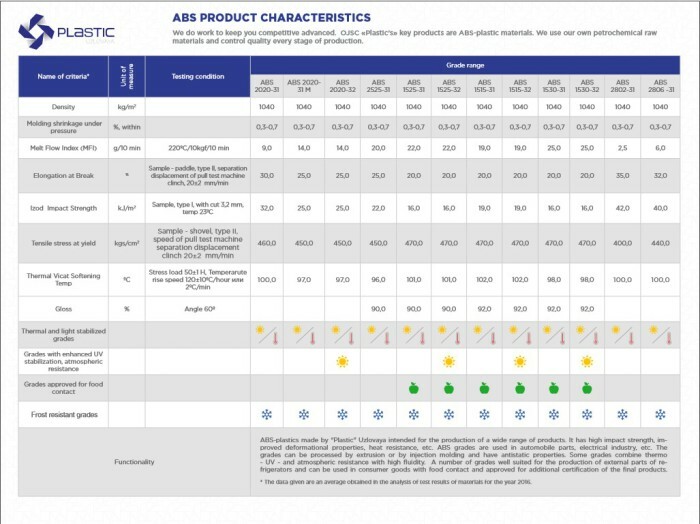 Flame retardant grades of ABS are used for molding housings of the assemblies, plant units, instruments, parts of technical products and household goods. Some brands are certified for food contact.